A 16th century Hungarian countess named Elizebeth Bathory rivals the tales of horror told in almost any land. Her crimes were evil beyond description, though some say she was more insane than evil. Who is she?What has she to do with Dracula? Elizebeth Bathory was a well-educated and clever woman, but she possessed a tremendous cruel streak. Apparently fearing her own mortality after the death of her husband, she became sadistic towards her servants and eventually sought to acquire if not eternal life or longevity, then at least the appearance of youthful skin by washing in blood. Elizebeth actually got tips on how to torture from her husband who, as a soldier, used to brutalize Turkish prisoners-of-war. Bathory reportedly murdered scores of women, sometimes aided in her brutal deeds by her underlings. Bathory beat her victims routinely and mutilated them as well. Reportedly she froze some in the snows of winter near her home called Castle Csejthe, dumping ice water on them in freezing weather. There were possible acts of cannibalism as well; allegedly Bathory once took several bites out of the flesh of a living servant girl. And there were legendary tales of the Blood Countess literally bathing in the blood of virgin girls in the hopes of remaining young. 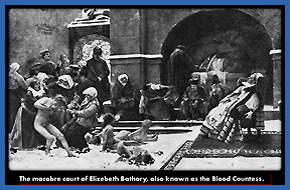 Nevertheless, it is quite clear that the Hungarian countess Elizebeth Bathory did exist and that she committed evil acts. Another source says she drank the blood of 650 girls who were also murdered. As the body count grew, Bathory's servants dumped the corpses outside the castle. When local peasants found the dead bodies, drained of blood, naturally they assumed vampires killed them. Rumors spread. In 1610 she was arrested after her attempts to kill girls of nobler birth; apparently the grounds for arrest pertained to alleged witchcraft, not vampirism per se. Reportedly victims were found in the castle drained of blood. The countess' henchmen were put to death by the authorities and Elizebeth was imprisoned in her bedroom in her Castle in the Carpathian Mountains until her death years later. The only real evidence of Bathory's atrocities were recalled in her two trials in 1611 - though she was never allowed to appear personally in court, only her henchmen appeared. Still, many myths have continued to flourish about her. It is said that some people even today claim to see her ghostly vision in her homeland in the Carpathians, prowling at night... in search of blood.Legend or truth?